DIE Sabbati, 29 die Decembris. Marq. Dorchester's Thanks for his Discharge. Message from H. C. for a Conference about an Impeachment against L. Mordant. King's Answer to the Lords Petition for a Commission to take Public Accompts. To be communicated to H. C.
Report of the Conference about the Canary Company Patent. Petition to the King, not to grant Licenses contrary to the Intent of the Bill. Heads for a Conference about the Bill. Conference about the Poll Bill. Seawen's Petition, for a Bill to be restored in Blood. Seawen's Bill to be restored in Blood. The Marquis of Dorchester gave this House humble Thanks, for their Lordships Favour in releasing him from his late Restraint, and admitting him to come and fit in this House to do his Duty as a Peer, promising to be more careful for the future not to offend their Lordships in the like Nature. To the same Effect, the Duke of Bucks expressed himself. The Lord Chamberlain reported, "That the Committee have considered of the Bill for settling the Estate of John Bodvell Esquire, deceased; and do think it fit to pass as it is, without any Alterations or Amendments." Hodie 3a vice lecta est Billa, "An Act for settling the Estate of John Bodvell Esquire, deceased." Hodie 3a vice lecta est Billa, "An Act for raising Monies, by a Poll and otherwise, towards the Maintenance of the present War." The Question being put, "Whether this Bill, with the Alterations, Additions, and Provisos now read, shall pass?" To desire a Conference, upon an Impeachment which the House of Commons have prepared, of High Crimes and Misdemeanors against John Viscount Mordant. That the Lords will give a present Conference, in the Painted Chamber, upon the Subject Matter desired. The Earl of Bridgwater, Earl of Bolingbrooke, Earl of Anglesey, and the Earl of Essex, are appointed Reporters of this Conference. Hodie 3a vice lecta est Billa, "An Act for uniting of Churches, and raising of Maintenance for Ministers, in the Town of South'ton." "Though His Majesty hath not yet found any Cause to suspect the Integrity of His Officers intrusted by Him for the receiving and issuing out His Monies; yet no Man can be so much concerned as His Majesty, that their Integrity be made manifest, or their Corruption punished: And therefore His Majesty doth very willingly (though this Way of taking such Accompts hath not been usual) comply with the Desire and Advice of His House of Peers; and, to that Purpose, His Will and Pleasure is, That a Commission do forthwith pass the Great Seal of England, to authorize the Right Honourable John Earl of Bridgwater, Oliver Earl of Bullingbrooke, Robert Earl of Aylesbury, Edward Viscount Conway, John Lord Lucas, and John Lord Crewe, together with Sir William Lowther, Sir Thomas Meeres, Sir Humphrey Winch, Sir Thomas Littleton, Sir William Thompson, Sir Thomas Osborne, Sir Thomas Gower, Colonel Samuell Sandis, Giles Strangeways Esquire, William Garway Esquire, Edward Buscowen Esquire, and John Jones Esquire, or any Five of them, whereof the Earl of Bridgwater, the Earl of Bullingbrook, the Earl of Aylsebury, the Lord Conway, the Lord Lucas, or the Lord Crewe, to be One, to take the Accompts of all such Monies as have been granted and received by Virtue of a late Act, intituled, "An Act for granting of a Royal Aid to His Majesty, of Twenty Four Hundred Three Score and Seventeen Thousand and Five Hundred Pounds, to be raised, levied, and paid, in the Space of Three Years;" and also for the taking the Accompts of Twelve Hundred and Fifty Thousand Pounds, granted by a late Act, intituled, "An Act for the granting the Sum of Twelve Hundred and Fifty Thousand Pounds to the King's Majesty, for His further Supply;" and also for taking the Accompts of Two Hundred and Ten Thousand Pounds granted for Three Months, at the Rate of Seventy Thousand Pounds per Mensem, by an Act, intituled, "An Act for ordering the Forces in the several Counties of this Kingdom;" and also for the taking of the Accompts of such Monies and Profits as have been made of Prizes taken since the Beginning of this present War; as also for all Sum and Sums of Money, and Provisions, and other Things whatsoever, which have been given, raised, or assigned, for or towards the fitting or setting forth to Sea the Navies and Ships of War, or other Maintenance, or Management of the present War, and to administer Oaths, with such other Powers as shall be found necessary. And His Majesty further declares, That He will not supersede this Commission till it hath had its full Effect. "At the Court at Whitehall, the 29th Day of December, 1666." ORDERED, That this Answer of His Majesty be communicated to the House of Commons, at a Conference; and to express the Reasons for this Expedient. ORDERED, That the Report of the Conference concerning the Patent granted to the Canary Company shall be made on Wednesday next. The Earl of Bridgwater reported from the Committee for the Bill against importing of Irish Cattle, the Matter of the Conference with the House of Commons, and the Reasons to be offered to the Matter of the late Conference. 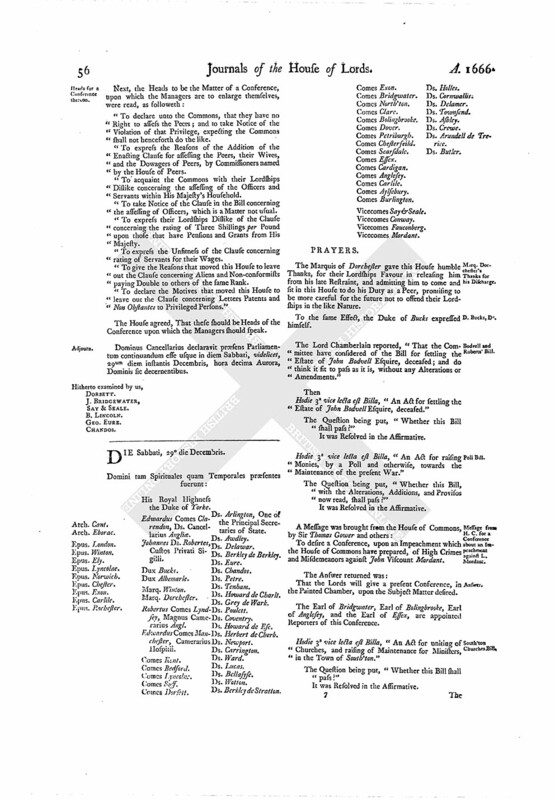 "Whereas we, Your Majesty's loyal Subjects the Lords Spiritual and Temporal and Commons in Parliament assembled, have presented Your Majesty with a Bill against importing Cattle from Ireland, &c. and yet it is like to prove ineffectual, unless the Persons thereby authorized to make Seizure of Cattle imported be freed from all Apprehension that any License or Dispensation may be given by Your Majesty for importing of the said Cattle. "May it therefore please Your Majesty, at the humble Petition of us Your loyal Subjects the said Lords and Commons, to grant, That no License, or Dispensation, be given to any Person or Persons whatsoever, contrary to the true Intent and Meaning of the said Act, intituled, An Act against importing Cattle from Ireland, and other Parts beyond the Seas, and Fish taken by Foreigners." This House agrees to this Petition; and that it be presented to His Majesty in the Manner aforesaid. Next, was read the Reasons prepared to be offered at a Free Conference, in Answer to the Reasons offered by the House of Commons at their last Conference upon the Bill against importing Irish Cattle, &c.
"1. 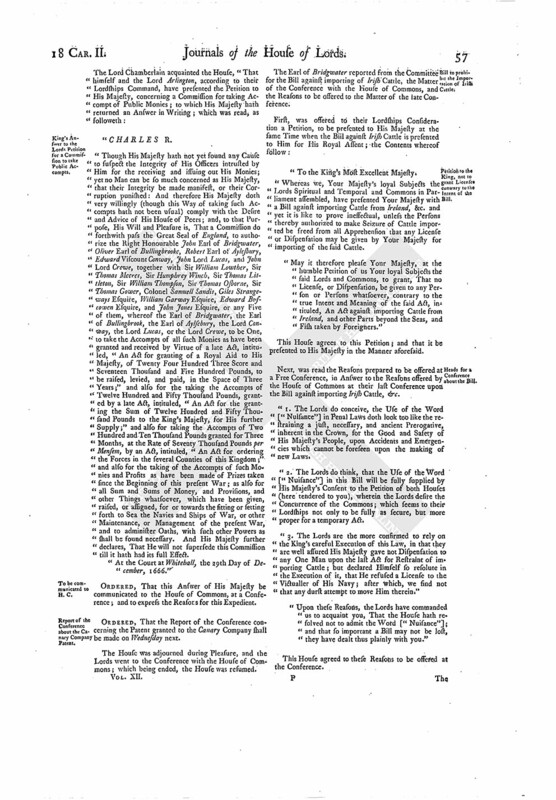 The Lords do conceive, the Use of the Word ["Nuisance"] in Penal Laws doth look too like the restraining a just, necessary, and ancient Prerogative, inherent in the Crown, for the Good and Safety of His Majesty's People, upon Accidents and Emergencies which cannot be foreseen upon the making of new Laws. "2. The Lords do think, that the Use of the Word ["Nuisance"] in this Bill will be fully supplied by His Majesty's Consent to the Petition of both Houses (here tendered to you), wherein the Lords desire the Concurrence of the Commons; which seems to their Lordships not only to be fully as secure, but more proper for a temporary Act. "3. The Lords are the more confirmed to rely on the King's careful Execution of this Law, in that they are well assured His Majesty gave not Dispensation to any One Man upon the last Act for Restraint of importing Cattle; but declared Himself so resolute in the Execution of it, that He refused a License to the Victualler of His Navy; after which, we find not that any durst attempt to move Him therein." "Upon these Reasons, the Lords have commanded us to acquaint you, That the House hath resolved not to admit the Word ["Nuisance"]; and that so important a Bill may not be lost, they have dealt thus plainly with you." This House agreed to these Reasons to be offered at the Conference. The Question being put, "Whether the Reason expressing the Want of Veracity of the Word ["Nuisance"] shall be added to the other Reasons?" This House agrees with the House of Commons to leave out the Proviso for importing Irish Cattle for the City of London; and the Managers of the Free Conference are to take Notice, that the House of Commons have given no Answer concerning the leaving out the Word ["altogether"]. Are appointed to be Managers of this Free Conference concerning Irish Cattle. Are appointed to be Managers of the Conference concerning the Poll Bill; and the Business concerning taking Accompts of Public Monies. 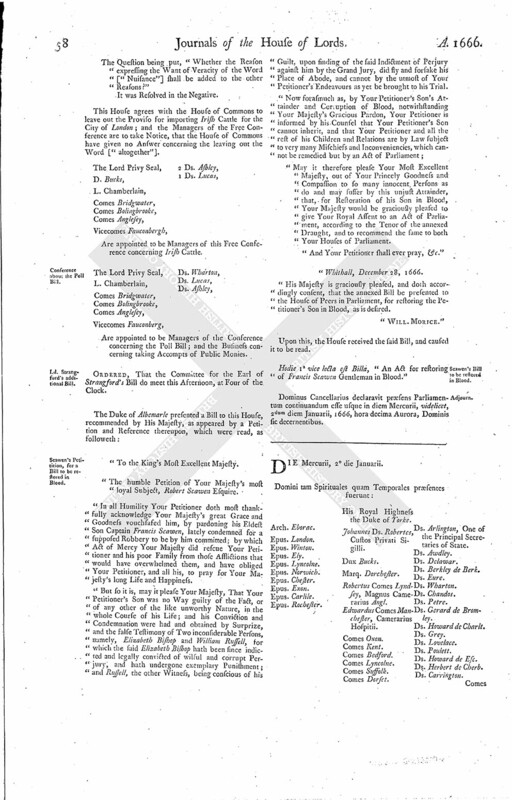 ORDERED, That the Committee for the Earl of Strangford's Bill do meet this Afternoon, at Four of the Clock. "The humble Petition of Your Majesty's most loyal Subject, Robert Scawen Esquire. "In all Humility Your Petitioner doth most thankfully acknowledge Your Majesty's great Grace and Goodness vouchsafed him, by pardoning his Eldest Son Captain Francis Scawen, lately condemned for a supposed Robbery to be by him committed; by which Act of Mercy Your Majesty did rescue Your Petitioner and his poor Family from those Afflictions that would have overwhelmed them, and have obliged Your Petitioner, and all his, to pray for Your Majesty's long Life and Happiness. "But so it is, may it please Your Majesty, That Your Petitioner's Son was no Way guilty of the Fact, or of any other of the like unworthy Nature, in the whole Course of his Life; and his Conviction and Condemnation were had and obtained by Surprize, and the false Testimony of Two inconsiderable Persons, namely, Elizabeth Bishop and William Russell, for which the said Elizabeth Bishop hath been since indicted and legally convicted of wilful and corrupt Perjury, and hath undergone exemplary Punishment; and Russell, the other Witness, being conscious of his Guilt, upon finding of the said Indictment of Perjury against him by the Grand Jury, did fly and forsake his Place of Abode, and cannot by the utmost of Your Petitioner's Endeavours as yet be brought to his Trial. "May it therefore please Your Most Excellent Majesty, out of Your Princely Goodness and Compassion to so many innocent Persons as do and may suffer by this unjust Attainder, that, for Restoration of his Son in Blood, Your Majesty would be graciously pleased to give Your Royal Assent to an Act of Parliament, according to the Tenor of the annexed Draught, and to recommend the same to both Your Houses of Parliament. "And Your Petitioner shall ever pray, &c."
"His Majesty is graciously pleased, and doth accordingly consent, that the annexed Bill be presented to the House of Peers in Parliament, for restoring the Petitioner's Son in Blood, as is desired. Upon this, the House received the said Bill, and caused it to be read. Hodie 1a vice lecta est Billa, "An Act for restoring of Francis Scawen Gentleman in Blood." Dominus Cancellarius declaravit præsens Parliamentum continuandum esse usque in diem Mercurii, videlicet, 2dum diem Januarii, 1666, hora decima Aurora, Dominis sic decernentibus.